This book is about a boy called Jackson. One Christmas Eve, Jackson decided that he needed to meet Father Christmas. During the night, whilst most children are asleep, Father Christmas crept down the chimney at Jackson’s house. When he reached the bottom, Jackson scared him and Father Christmas sprained his ankle. Jackson agreed to help Father Christmas deliver the presents to all the children around the world but in return Father Christmas had to tell him his story! Father Christmas was once a mean-spirited man but after his adventure meeting his past, present and future, he finds the true meaning of Christmas and that’s how he became Father Christmas. 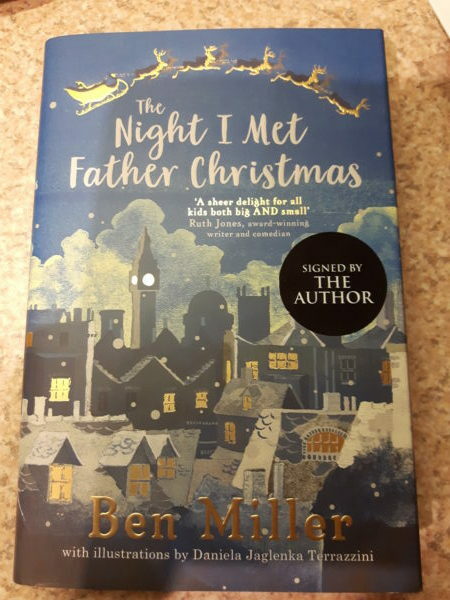 The book is similar to A Christmas Carol but it is easier for younger readers to understand and this story is more magical and jam-packed with tales about elves, runaway Christmas trees, a big scary snowman and a well-known reindeer with a touch of flu! We give this book 6/5 and recommend it to 9+ readers. Thank you once again for our signed copy, which has been proudly placed on “The Book Brothers signed bookshelf”.